I've been very fully occupied sorting out things to do with my mother's estate. I'm trying to get round blogs so my apologies if I haven't yet reached yours! And I also have a couple of trips coming up, soon, so my time has been very full. One of the trips is to Greece. We used to go to Greece so often (almost always with our bikes - the Greeks thought we were totally insane cycling round rural roads in remote areas).that T and I actually learned some Greek. Where we went, people often hardly spoke any English. 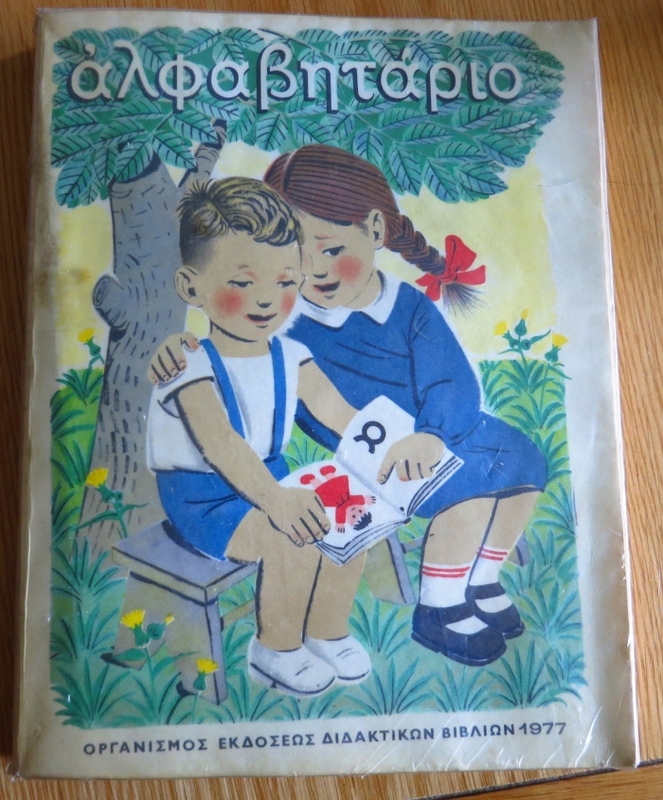 We took Greek lessons with a delightful man who was convinced that the best possible textbook for us was an ancient children's alphabet primer. It gave interesting glimpses of the daily life of country people not so very long ago. Here is the page to teach the infants the letter "fi." You see little Anna confidently blowing the flames to make the fire blaze up, and when the flames don't get high enough, she gets more kindling until she succeeds. Of course children had to do this and no doubt were taught to be careful..
A later edition of the book had new pictures. In the new book, Anna is blowing the fire rather than feeding sticks into it by herself. But I love this picture, she looks so calm and competent in her little apron and her ankle strap shoes. Unfortunately I forgot all the Greek I ever learned. I don't have any talent for languages, but T is now reminding himself (with the BBC language course) of what he has forgotten, so I expect we'll be fine. Where we're going, they probably all speak English anyway. Other than studying Greek, we found time yesterday to take S to the annual Model Railways show at Alexandra Palace. It is a regular outing and we always enjoy it. I never fail to marvel at the absolutely incredible model making skills of the club members who exhibit. I don't suppose they are professionals, and yet they turn out work that could hardly be improved upon. Each year we try to choose our favourite diorama, although it is always hard to pick just one. Since the weather outside is so cold outside, this frosty diorama of Kinmundy appealed to young S.
London's actually getting better weather than most other bits of the country, so we didn't have any problems getting to the venue, unlike some of the exhibitors, who didn't manage to turn up. Parts of the trip between our home and Alexandra Palace were lovely in a Lion Witch and Wardrobe-y way. Actually I didn't feel too well, and ended up looking like poor old Yiayia (Grandma) in this picture. I see that I have written the translation (although I am darned if I could translate it now.) Grandma reckons that it is freezing, and she wants her corner by the fireplace. Corner by the fireplace! YESSSSSSSSSSSSS! Those illustrations were lovely...they'd induce even me to try to learn a few words. Ahh, Greece. I hope to make it back there someday. I loved the Cornish village. I do wish I could send you some of our heat. We were close to 100 degrees F last week, all but skipping spring entirely. I’ve always thought that being a model railway enthusiast gives boys and men an acceptable way to pretend and play similarly to how girls do with dollhouses. I have marveled at amazing miniature railways winding through detailed Lilliputian-sized towns. The pictures in the book are interesting too. These days it would seem dangerous that a girl so young is playing with fire … especially with that checkered material draped nearby. But the fireplace does look cozy and I guess you had to know how to build it early in those days. I wonder how you will find Greece in your upcoming travels. They have been through so much and it will be interesting to read your views. At least Greece will be warm! You will remember the words when you get there, usually they just ask for money these days I suspect! I wish you lots of fun and adventures in Greece. Yes, Penelope, the picture worried me, but I am sure a child of six or seven COULD be taught to lay a fire safely and deal with it so long as it was in a stove. In fact, they would probably have to, their mother would probably need help with the cooking and chores. My grandparents generation in the countryside had kids doing farm work etc. 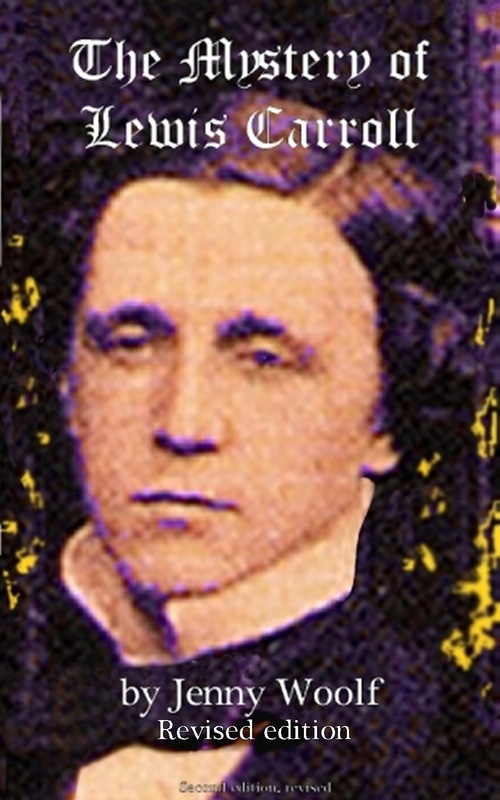 from a very young age. Adullamite, I never knew any normal person ask for money in Greece, however poor they were, they were very honest and also highly hospitable even if all they could offer you was a glass of water. Actually I don't think poverty is the main reason why people will ask for money (unless they are quite literally starving of course in which case they usually ask for food). I really don't think that going through hard times makes people cheat and panhandle, if everyone else is in the same boat - but feeling singled out for bad things compared with others, seems to bring out the worst in everyone. 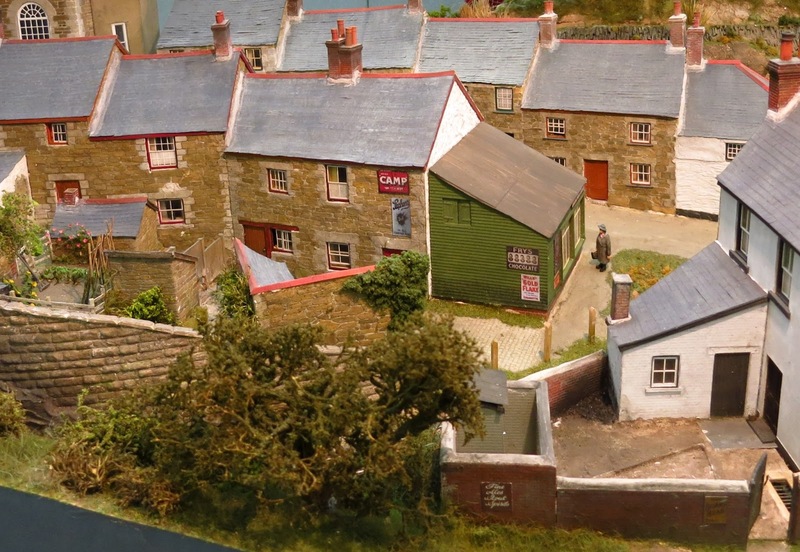 The miniature villages for the model railways are wonderful! I work with a grown up steam railway, but only because I love model ones and have never had one. Enjoy your break, and the heat. The best trip I ever took was to Greece. I left my large family behind and went on a trip with a friend. We had the most glorious time. It is a place everybody should visit at least one time in their life. I love the model railroad. It brings back memories of my youth as everyone in my neighborhood had one, some more detailed than others. I was always fascinated and could watch them for hours. I love learning from children's books, they do such a brilliant job compared to many 'adult' level books! The illustrations are marvelous too. Also, gorgeous snow scene - we're facing the same and I can't wait for Spring! I used to go to Greece nearly every year for some years but haven't visited for at least 15 years now. I used to know several words but can't bring a single one to mind now. I must admit I would love to visit again and may just mention it to the Mr as an idea for the next holiday. The frosty diorama looks so real. I used to have a friend who built a whole railway circuit in his back garden. The amount of detail the enthusiasts put into their 'villages' amazes me. Greek? It's ALL Greek to me! Anything in miniature gets my vote: dollshouses, model villages etc. so this would have been areal treat for me too. I hope you're feeling better now and didn't succumb to some horrible bug. Just keep thinking of the Greek sunshine! I wouldn't mind a corner by the fireplace, either! Lovely models, the village is so enchanting! That primer is adorable and the art would be lovely framed. The poor grandmama. We think she had a warm corner, but her front would roast and her back freeze. I believe this band of snow circles the entire globe, and seems to be dropping down toward the equator, too. I guess I'm past ready for spring. The model is enchanting -- looks like a fun day. I've also bought children's books to try to learn French. 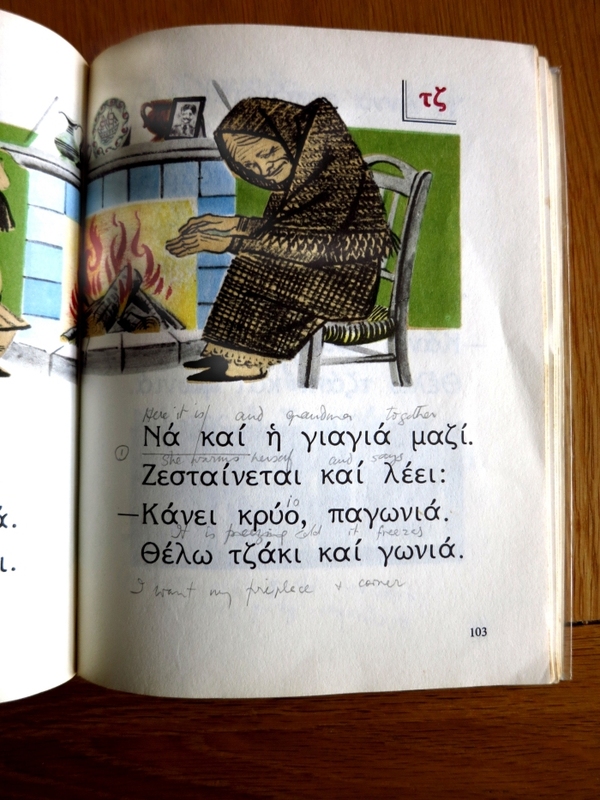 I think it is probably much easier than learning Greek -- but I do love the illustrations in this one. It's a beautiful book! It's my love for old books like that which has me with a library full! Enjoy Greece, i have fond memories of it, and one scary one -- a shop owner waited for my friends to step out of the store and grabbed me to keep me from leaving. Then he tried to convince me to marry him! He probably wanted a way into the US, and was hoping i would oblige, but at 15 i was scared to death! Sounds like a fun place to go. I looked at the Greek writing and it looks beautiful. Love the pictures in the book. Help, Mimi! I'm wondering how you escaped from that difficult situation.... You are so right, Joanne. I've found you have to get right IN the fireplace, those old fashioned (but surely rather dangerous ones) with the seats inside in a sort of inglenook. And yes, I love miniatures too. I think that the kind of women who love miniatures and are clever with their hands, make dolls houses. The equivalent men seem to go in for model railways. Greek looks like such a hard language to master! Whenever we travel, I try to learn at least a few basic phrases so I can recognize things, but mostly, I have found people speak English and are happy to practice. Wow those models look amazing. I love the frosty looking one. Yes we've been quite fortunate with the snow too. We got away with a few inches but it didn't really settle on the roads. I wouldn't let me 14 year old near fire like that!! I wish you many happy adventures in Greece and would gladly send some of my beautiful Spring weather to you if I could. I'm a huge fan of reaching for children's books when learning something new. I had a particularly challenging anatomy and physiology class in college once and found that my 4th-grade son was learning the same topic in school. I borrowed his book to get me started, and then moved on to my text book. There's nothing better than getting lost in a miniature world of old houses, streets, fields, and railroads...well, except maybe a vacation in Greece! Looking forward to the pictures you'll have for us. I love those pictures in the book :-) I think I was safe around an open fire by that age, although not necessarily able to light it myself! I'm in Greece for the first time right now - on Samos. Where will you be visiting? I hope you're well enough to enjoy Greece. That exhibition sounds wonderful - the lure of the miniature is very strong. Jenny, I love this book! Some letters are similar to Russian, some aren't. A letter 'fi' is in Russian 'ф'. 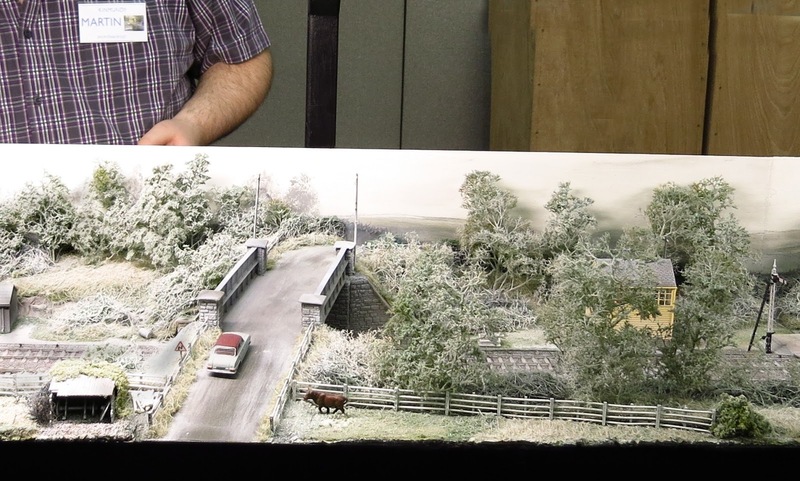 The rail dioramas are wonderful, I always was delighted with people who could make these small but real things. It's always a joy to see your post, and I know you're here when you can be! This was really interesting and fun- thanks for sharing! We were taught Ancient Greek at school, just briefly, by our headmistress. The textbook was about Thrasymachus and was deadly dull. I would have preferred this primer. All I remember now is 'thunder and lightning' and how to sing 'Oh Dear What Can the Matter Be?'. The alphabet has largely stayed with me. It was pinned on the wall opposite my place at the dining table. Most interesting, your story about learning Greek. I really enjoyed it. It's a good examples for people who are reluctant to learn a foreign language and don't realise the benefits of it. And I loved your photos, too. Many thanks. 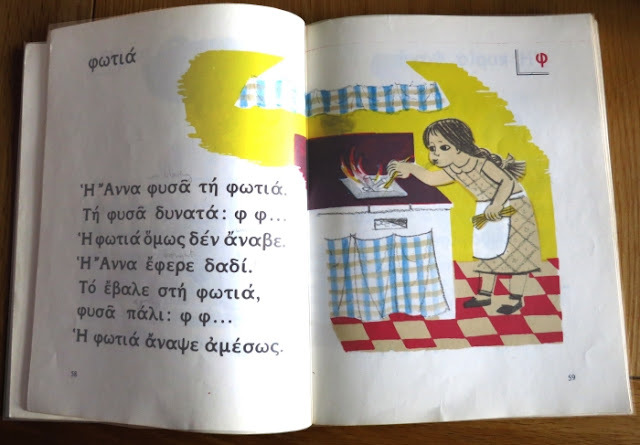 The Greek children's books are delightful even if I don't speak a word of Greek. If I had your weather I'd want to be sitting by the fire as well. I'll bet you are looking forward to your trip, warm weather and sunshine. I just returned from a place where it was in the mid 80's F. daily. It was a treat! Hm,Lucille, "Oh Dear What can the matter Be" in Ancient Greek - you know, there's something slightly surreal about that! I will be in Rhodes, Rachel. I've never been there before actually, so it's about time I put that right. I almost thought I saw Mr. Tumnus and the lamp post in your Narnia-esque photograph. Beautiful wintry scene there. We've skipped winter altogether here and are in full, spring bloom. How wonderful that Greece is so familiar to you! I've only been there once. I was so thrilled when my family went there when I was a teenager. I just loved Homer, Classical mythology and Western Civ - what little I knew anyway. I couldn't believe I was seeing all that archaeology. And, my little brother (8 yrs. old at the time), was clambering on top of the ruins and fallen columns! Back then, nobody shooed you away. Maybe they still don't? Interestingly enough, because of the higher mathematics I had pursued (we used every greek symbol), I found I could read Greek! Comprehension was a different story, but since we have so many Greek root words in our language, I could get the barest gist of things. Based on math, does the title of your book read "Alphabetario"? Love those pictures in the old books too. I had a fascination for braids, skirts and mary janes when I was a little girl based on those types of images! What extraordinary pieces of work those little villages are! I did a double take on that Cornish village scene. Quite admirable attention to detail. I love doll-size anything, and still have some special silver filigree miniature table & chairs, and porcelain doll tea sets from when I was young. Never had a proper doll house to go with it though (despite asking Santa many years in a row!). Yes Jenny, but it's "alfavitario" because of the way they pronounce beta. Ha!but I heard someone speaking Greek yesterday and couldn't understand a word! I went through a spell of model making a few years ago (third childhood) and found it remarkably satisfying. Once you get involved in doing a house or a barn or a farmyard the whole thing becolmes the centre of the universe and all one's troubles disppear. I can thoroughly recommend it as therapy and the results are so attractive. I once learned Greek because I was in a relationship with a Greek who spoke little English. There’s love for you. He turned out to be a rotter so I forgot most of the Greek again. Have a great time and it won’t be too difficult to pick up a word or two in a taverna, will it? It's an advantage that so many people in other countries speak English, but also a disadvantage in that there's little incentive to learn another language. I speak a bit of Italian, but when I go to Italy the locals insist on speaking English and I get so little practice that I return home knowing scarcely more Italian than when I left. "Lion, Witch, and Wardrobey way"--love it! Also the delightfully dated yet timeless illustrations in the children's Greek books. Lucky you, soon off to Greece, but a well-deserved trip, nevertheless. When I was a child mom and I went to Turkey for 4 months to visit and bring back grandmother to Paris. She had Greek tenants downstairs and I played with the children. Mother said that I could converse with them in Greek and in Turkish with the little boy next door – I must have forgotten all this when I went back to France as I don’t recall much, just maybe something like “paízoun mazí mou” play with me? It all sounds wonderful Jenny! I have absolutely no talent for learning languages, either. I admire people who do. The dioramas are stunning. 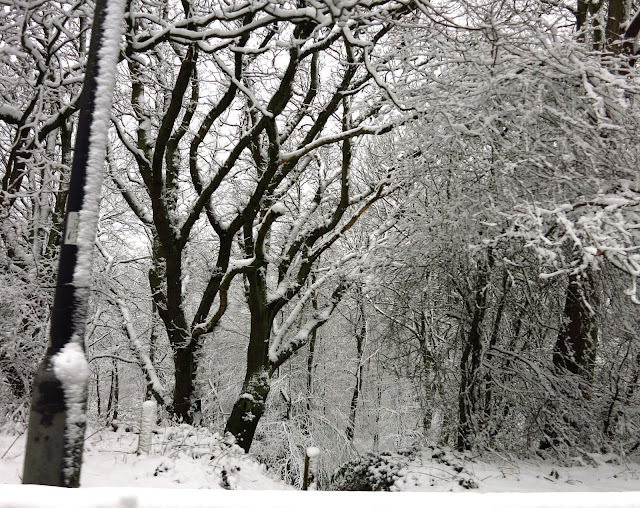 And I love the picture of the snowy woods. the Greek books are very interesting!! I hope that you are now fully recovered and that you enjoy your upcoming trips. I've never been to Greece although it's a possibility in the next year or two - with a friend who speaks some Greek. I've just been round the model railway in Napier which I thought was rather good until, that is, I saw your photo. I was once in Greece for their Easter - on the island of Aegina. We joined the midnight procession from the church holding lighted candles. It was a magical experience. But my only Greek word is epharisto (think that's right - it was a long time back). Hope your trip is magical for you. 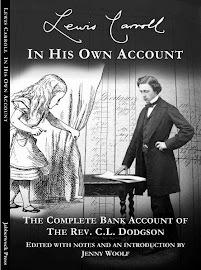 Many of us [points finger at himself] have been less than faithful in our blog rounds, and with much less reason than yours. Take your time, sort things out, and enjoy some travel. And God bless. Hmmm, I've been thinking of getting some books in Serbian for some time to help me with my studies and I think you've convinced me this is a good idea. I'm clearly not going to learn this language through discipline and attending classes so books and conversation might be the way. I have a Serbian friend so I think I'll offer to send her English language books in exchange for Serbian children's books. I have never been to Greece but always wanted to go. As for learning to speak greek, well, I think that I am too old now! And I have enough problem with English anyway! Sigh. I really really need to try conquer my flying fears.....! oh, i'd love to go to greece, but i'd definitely need to stay where there was some English spoken, or maybe i could join a tour. Where can I buy the Greek Alphabet Primer books again? I miss it. I grew up going to Greek School every Saturday, and that was our textbook. So many great memories reading, learning.